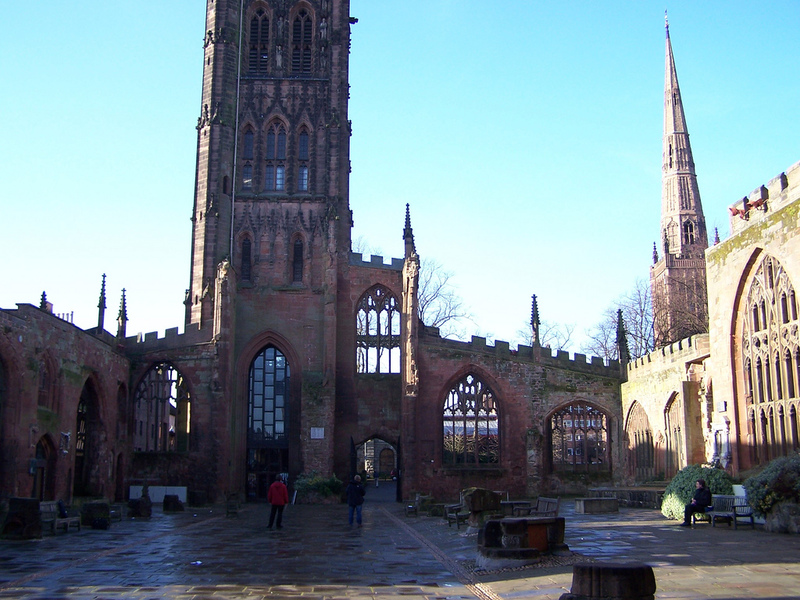 On a cold but sunny December day in 2005 I stood in the old ruined Cathedral in Coventry, UK. I have two photos taken that day; one in the ruins of the old Cathedral and another outside the new. In their contrast and contradiction, they tell one unified story. The first, is the altar in the old bombed out Cathedral. On the 14th of November 1940 the Luftwaffe blitzed Coventry. One of the victims was its 800 year old Cathedral. 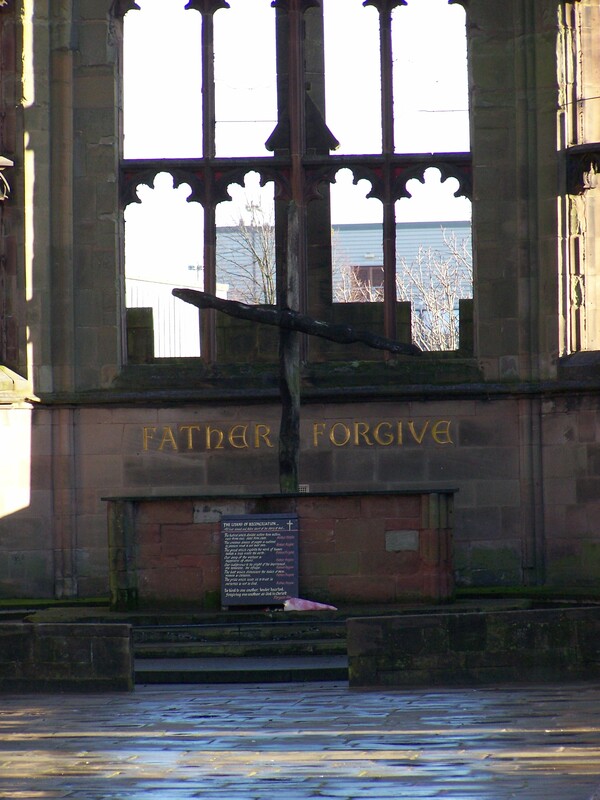 Today, where the altar once stood, is a plaque that simply says, “Father Forgive”. Above this is a simple wooden cross made from charred beams which survived the conflagration. In front of this stands a board with a simple Litany of Reconciliation, the refrain to which is, “Father Forgive”, as well as a small bunch of flowers. The other image is on the outside wall of the new Cathedral consecrated in 1962. 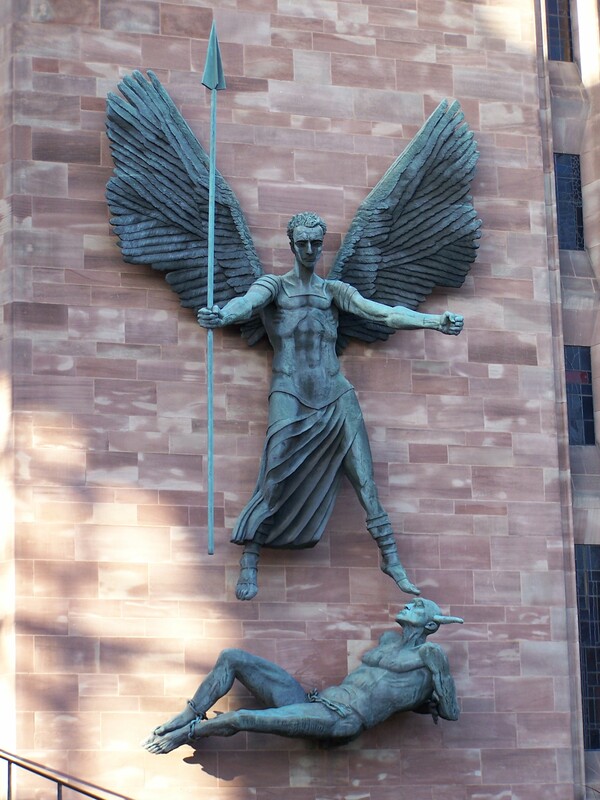 It is of St Michael’s victory over Satan by Jacob Epstein. This dramatic sculpture represents St. Michael (meaning “who is like God”) a Biblical figure. We see references in Daniel 10:13,21 and possibly Joshua 5:13-15, Jude and Revelation. In Scripture St. Michael is presented as a protector of God’s people. The obvious question is, where was St. Michael on the night the Cathedral was bombed? There is an irony in these two images. The answer lies at the altar of the old cathedral. The cross revealing Christ’s sacrifice for all God’s people – both the bomber and the bombed. This is reinforced with the words, “Father Forgive”. Brokenness lies at the heart of all of us. It is not the exclusive domain of a culture or nation. George Bush’s “axis of evil” comment in 2002, forgets that evil or sin isn’t exclusive. It encompasses us all. It is a curse from which we all need to be relieved. That a cultured country such as Germany could blitz Britain or a civilised community such as the UK be complicit in the razing of Dresden is a reminder that evil is not far off. We see it in Abu Ghraib, in Libya and in our own hearts. Yes, God does protect His people. For all those who come to faith in Christ there is protection. Not just for a moment or a life time – but eternity. There is a payment for our brokenness and a reconciliation with God. What sign should we look for that this truth is also ours. I think one sign must be our ability to say, like our Saviour, “Father Forgive”.